Earlier today, I published a short post describing how it was possible to do all sorts of wonderful things around a twitter hashtag community (well I think they’re wonderful – or some of them, at least…). 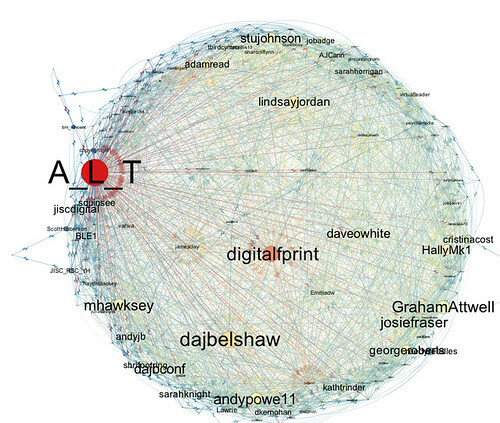 In this post, I’ll give a couple of illustrations using the #altc2010 hashtag from this year’s ALTC conference. First up, what does the inner structure of the hashtag community look like? That is, of the Twitter folk using the twitter hashtag (in fact, folk who’ve used the hashtag more than three times over the last couple of days), who follows whom? 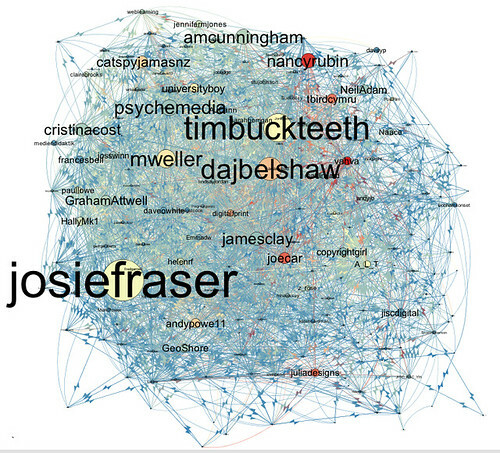 In the following graph, nodes are individual twitterers, edges go from a person to a person they follow, node size and label size is proportional to the number of hashtaggers following the named person (that is, the in degree of the node) and colour is proportional to the number of hashtaggers an individual is following (out degree; red is “hot”/high). This graph was produced using Gephi, which can also run stats over the graph. So for example, if we size the nodes according to betweenness, we can see which twitterers in the community are likely to be most effective at getting a message out across that community. If we grab the total number of followers and friends of each user (that is, including folk who have not used the hashtag and are not part of the hashtag community) and use that to set the size (number of followers) and colour (number of friends) of each user, we can see which twitterers are most likely to amplify the event outside of the community. Okay, so what else can we do? We can also feed the address of this list into a Yahoo pipe (described here) that will search through recent tweets visible through the list for hashtags. 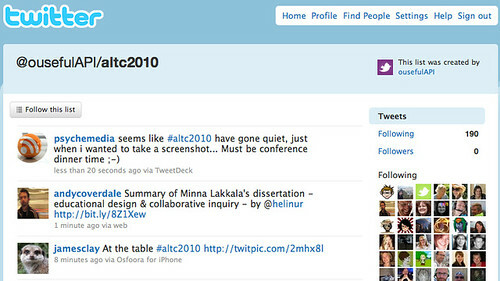 In this way we can use the folk who were twittering around ALTC2010 to act as an early warning beacon for other hashtags or hashtagged events in the educational technology area. 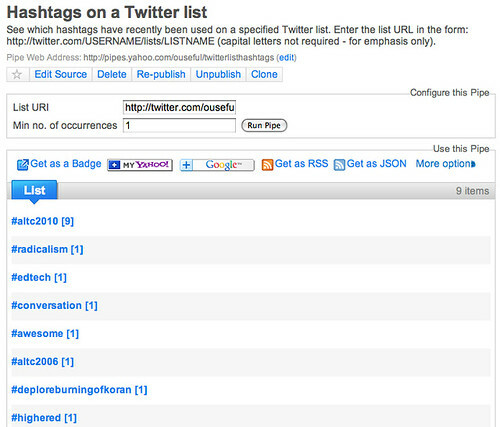 Something else we can do via the twitter list is grab everyone’s personal homepage URL, as declared on their twitter profile, and use these URLs to seed an ALTC2010 custom search engine. 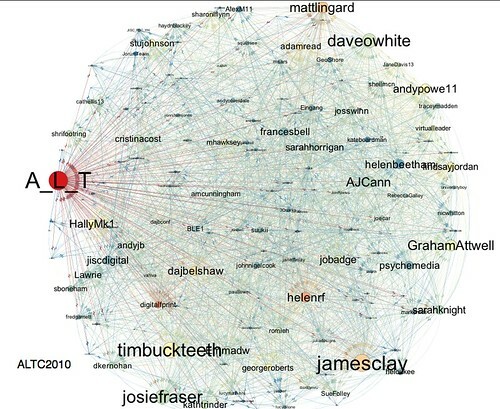 That is, a search engine over a good proportion of the personal pages of HE related UK educational technologists, as they declared themselves over Twitter circa September 2010. So, there we have it. The scripts are in place, so generating the screenshots, and writing this post, took waaaaaaaaaay longer than mining the twapperkeeper archive, setting up the lists, generating the graph files (though I still had to load them into gephi, lay them out and render them “by hand” i.e. by clicking a couple of buttons…) and seeding the custom search engine (which also had to be initially set up by hand). But why bother? Well, my developing idea is that we can mine events to define (automatically) a context around a particular subject area or domain (for example, a set of people interested in an expert in the area), and then draw on this context for search and discovery at a later date (e.g. through monitoring their twitter feeds via an auto-generated list to see what they – as a group of independent individuals – are talking about severally together, or by searching over just their personal webpages). PS odds on some f*****r has patented this approach; if they have, this was all my own work, and it was bleedin’ obvious, so s***w you, m**********r… sue me. Beautifully done an enormously powerful! Keep up the good work. Interesting and insightful. Thanks for sharing. This is useful! Thanks for doing it and posting it. Awesome! Scripts, please? 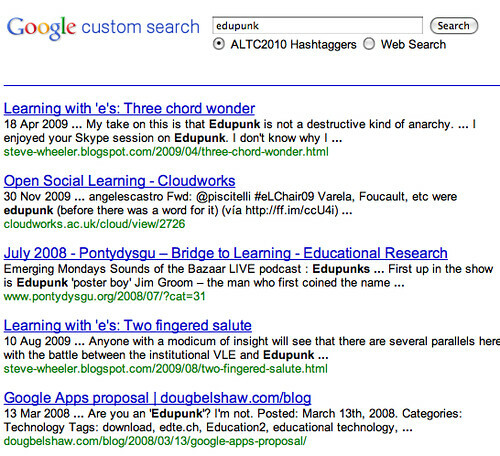 (I didn’t see these at https://blog.ouseful.info/2010/09/08/discovering-context-event-focusing/ either). Also, is there a way to auto-generate the Twitter list? Or do you do that part by hand? where ‘tag’ is the list slug. Creating lists is really handy for doing other things around sets of Twitter users because when you pull data user names from the list, it comes alomg with the total number of friends and followers, the personal homepage URL from the user’s Twitter profile, and so on. Great stuff – thanks for thinking this through. We’re working on some related stuff over at US Dept of Ed. This will definitely figure for us and thanks for laying it out. Great stuff as usual. Going to try and do some of this for the CETIS conference in November. There would be a nice little business in ‘Your twitter conference solutions’ – or at least some nicely packaged and easy to use tools that do this automatically. Funding? Also interesting in what it shows about the blurred boundaries of conferences – some of those featured (me and you for starters) weren’t even there.